View More In Cam & Groove Hose Fittings - Page 5. 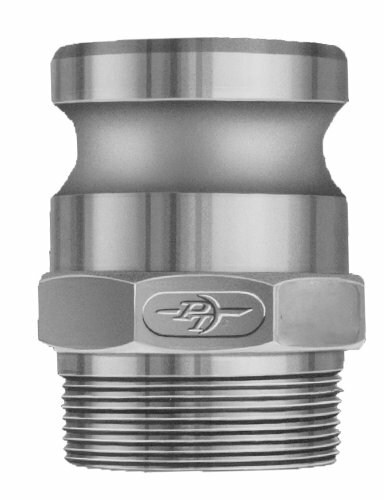 This PT Coupling Type F adapter has an aluminum body and a male National Pipe Taper (NPT) threaded connection for adapting NPT thread to a male cam and groove-style fitting. The aluminum body resists corrosion and abrasion, is light weight, and is suitable for use with water, hydraulic oil, coolants, gasoline, and petroleum products. This cam and groove adapter complies with Commercial Item Description A-A-59326D for quick disconnect fittings and is used in applications such as fuel delivery, wine transfer, and grain movement. PT Coupling manufactures pneumatic and hydraulic hose fittings for industrial and automotive applications. The company, founded in 1951 and headquartered in Enid, OK, meets International Organization for Standardization (ISO) standard 9001. If you have any questions about this product by PT Coupling, contact us by completing and submitting the form below. If you are looking for a specif part number, please include it with your message.